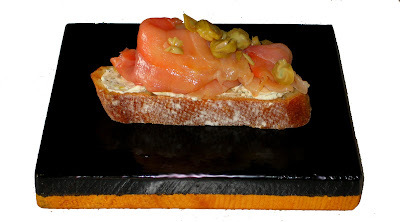 Gravlax is one of the most enjoyable appetizers for all seasons ever! We just love it and I cure salmon just about every month. It takes no more then 15-20 minutes to prepare from start to finish. What takes most time is the de-boning of the fillet. You have to make sure that all the bones regardless of size are removed. Use needle-nosed pliers for this task. At fish market ask for same cut from opposing sides of salmon. I prefer the tail cut because there is no waste like in a center cut where you have to remove the flabby fat from belly. Put the salt, sugar, crushed fennel, coriander and black pepper into a bowl and mix until evenly distributed. Spread the mixture on salmon making sure to cover whole fish. There shouldn’t be pink flesh visible. If using two fillets (my preferred method), repeat. 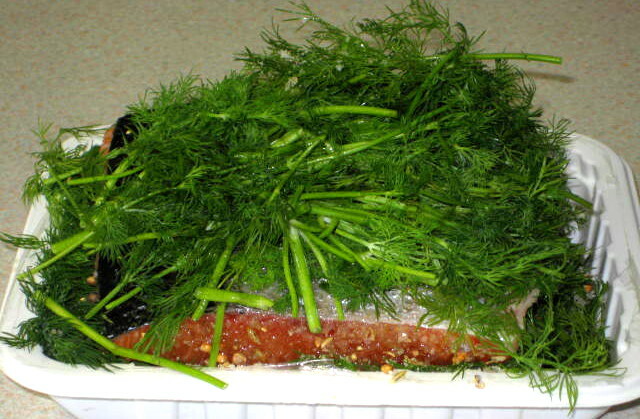 Place some dill at bottom of glass or ceramic container that will hold the filet comfortably and then put one fillet skin side down on top of dill. 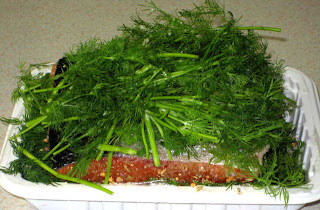 Cover the top of fillet with more dill (big but evenly spread bunch) and now place second fillet on top, this time flesh side down. 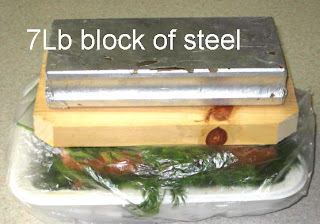 Cover with yet more dill and wrap container in plastic film. 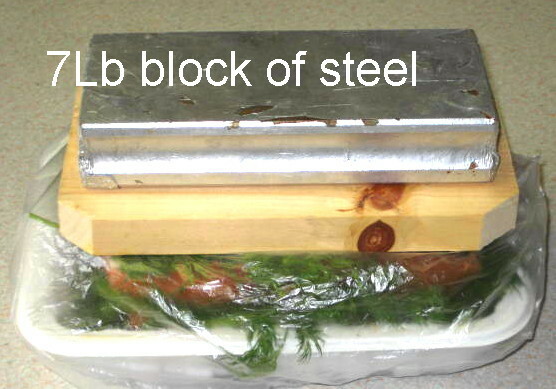 Place heavy weight (brick or similar) on top and refrigerate for at lest 3 days, turning over both fillets once a day. On 4th day, remove from refrigerator, discard dill and briefly wash under cold running water. Dry with paper towel and remove all seeds that stuck to flesh. Using very sharp knife, slice at shallow angle (just few degrees from parallel to cutting board) starting at the narrow (tail) end. Make the slices as thin as possible. Gravlax is served same way as smoked salmon; on toasted baguette slice, crackers, mini latke or on top of slice of cucumber. 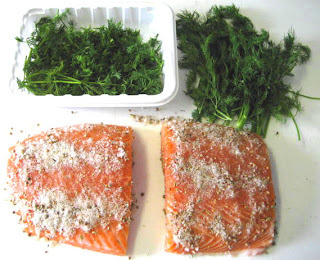 You can top gravlax with squeeze of lemon, chopped capers or gravlax sauce. Mix all ingredients in bowl till smooth and well combined.